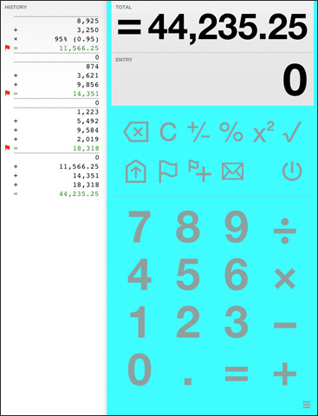 This is one of the coolest calculator apps I have seen. Not only is the typeface in Helvetica, but, you can also change the color palette of the backdrop or foreground, and the aspect ratios from landscape to portrait. Josh at shift-apps did a great job with this app and evokes the simplicity and comfort one needs when crunching sick financial numbers and the tape feature is key!